Welcome to our letters page. 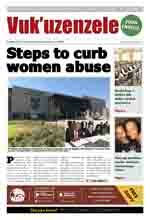 For our first edition, we kick off with a letter from the Minister in the Office of the President, Dr Essop Pahad. Your government is committed to building a democratic, non-racial, non-sexist South Africa that truly belongs to all who live in it. To achieve this requires open communication, partnerships and active engagement of all sectors of society. As we work to overcome the legacy of apartheid and create the conditions for an inclusive South Africa in which there is equality of opportunity for all, we are also required to keep you, the people, informed of our decisions, our actions, our policies and our programs. We must do this to be accountable and we must do this so that we can work together in a people’s contract amongst all South Africans, as we build a better life for all. An important vehicle for this vital communication between government and people is this magazine Vuk’uzenzele. This is the first edition of a magazine from Government aimed at those who most need to know about the services and programmes of government. We believe it is our duty to make sure that those who stand to benefit from economic and other opportunities know about them and how to use them. 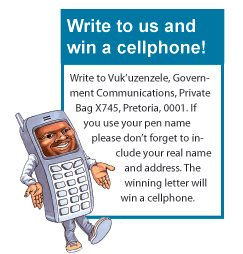 We see Vuk’uzenzele as an important two-way communication tool. It is a way of informing you of your rights and your responsibilities, of what your government is doing to improve people’s quality of life. It is a way of you telling us what we need to hear, and therefore what we need to do to move still faster towards our goals. When we achieved freedom and democracy eleven years ago we set out as a nation to change a very unfair and uneven playing field. Today there are many achievements and much progress to celebrate - but still many challenges in making sure that all the citizens of our country enjoy their rights to the full. You have a right to know what your government has been and continues to do. You have a right to know which services and programs you are eligible for; and you have a right to expect quality service delivery from public servants. Above all, you should take advantage of those services and opportunities and work with government to improve your life. I urge you to embrace Vuk’uzenzele. We decided it must be accessible and affordable for all. So Vuk’uzenzele is free. Read it. Share it with friends and family. Above all respond to the articles in it. Tell us what we need to do better. As many of your letters and comments, as possible, will be published in each edition. Vuk’uzenzele! Let us work together in the spirit of Letsema. Are you sure you are SINGLE?